Maradona: "It's a pleasure to see Messi like this"
Buenos Aires - Argentina coach Diego Maradona on Saturday praised Lionel Messi for his performance in the 4-0 win over Venezuela in Buenos Aires. "Seeing Messi like this everyday is a pleasure. We should all leave the stadium, pay for another ticket and go in again," Maradona said. Messi - who for the first time wore the number 10 Argentina jersey that was once worn by Maradona himself - was the man of the match in the resounding win. The Barcelona striker scored a goal and was decisively involved in two others. With reference to the whole team's performance in his first official match as Argentina coach, Maradona was thrilled. "It was better than I expected, reality beat fiction," he said. "Everyone wants to be in this national team, and I am proud of that. When we were 4-0 and Jonas (Gutierrez) blocked a ball and got it back, that's the kind of message I want to give," he stressed. He described the midfield made up of Maxi Rodriguez, Javier Mascherano, Fernando Gago and Gutierrez as ideal, and he also praised the forward line with Messi, Maradona's son-in-law Sergio Aguero and Carlos Tevez. Argentina is set to play Bolivia Wednesday, at high altitude in La Paz. "I see the team well-prepared," he said. 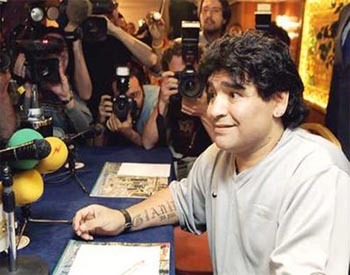 When asked about the change from the poor performances that cost Alfio Basile the position of national team coach in November, Maradona was modest.